Cook lasagna noodles to desired doneness as directed on package. Drain; rinse with hot water. Meanwhile, heat oven to 350°F. In medium saucepan, combine milk, flour and garlic salt; blend well. Cook over medium heat, stirring constantly, until mixture boils and thickens. 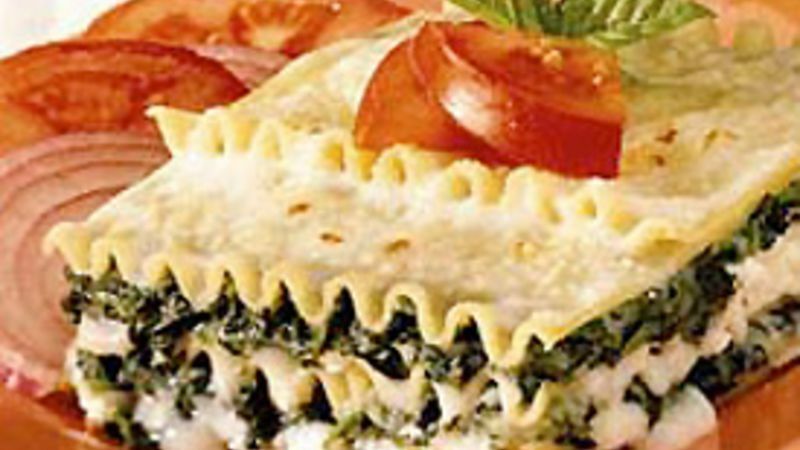 Reserve 1/2 cup white sauce for top layer of lasagna; stir spinach into remaining sauce. In medium bowl, combine cottage cheese and mozzarella. Spread 1/2 cup spinach sauce in bottom of ungreased 13x9-inch (3-quart) glass baking dish. Top with 3 lasagna noodles, half of cheese mixture and half of remaining spinach sauce; repeat layers. Top with last 3 noodles and reserved 1/2 cup white sauce. Sprinkle with Parmesan cheese. Bake at 350°F. for 30 to 40 minutes or until thoroughly heated. Let stand 5 to 10 minutes before serving. If desired, garnish individual servings with fresh basil and tomato wedges.